You knew I was going to say that, right? 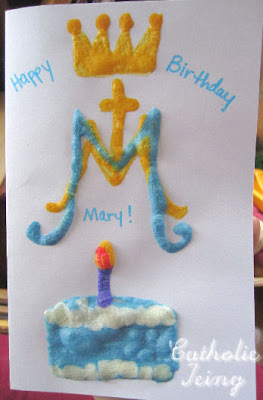 I think crafting some simple rosaries would be a great craft idea for Mary’s birthday! We crafted some slices of cake for Mary’s birthday. I found a cake slice template here, and printed several on card stock. First, cut out your cake slice template. Next, go ahead and fold the creases on the lines, and unfold to make it flat again. 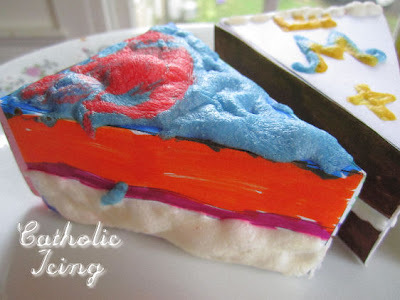 Then color with markers, and paint on the “icing” with homemade puffy paint (recipe below). Microwave it dry, and assemble the slice of cake with glue. 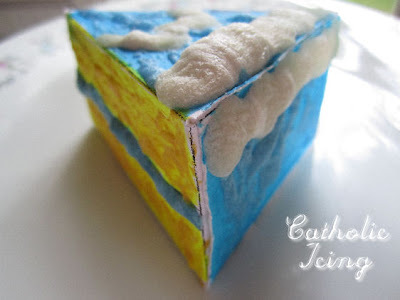 Make a paste out of the flour, salt, and water. 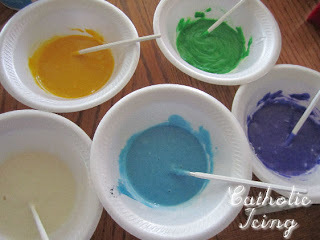 Color with food coloring. Paint on with a paint brush or a q-tip. When you’re finished, microwave it for about 30 seconds, until puffy and dry. This was so much fun to do! 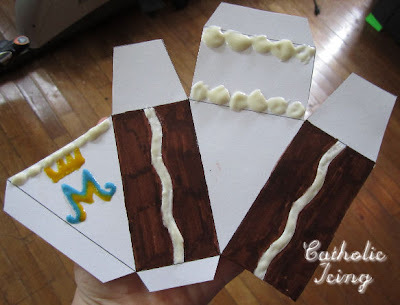 We are using our cake slice boxes to put our rosaries in and take to Mary’s birthday party. 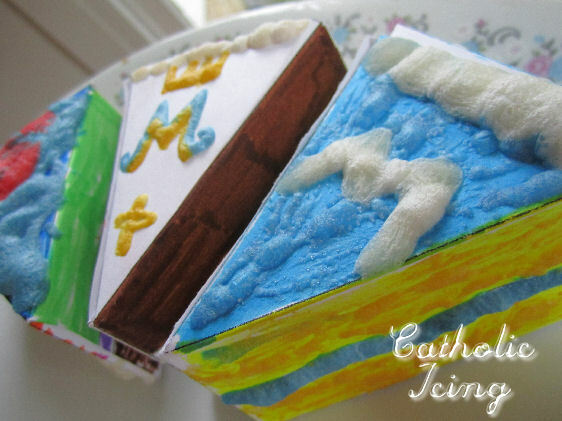 You could make 5 of these cake boxes, set them out on a cake plate, and number them 1-5. 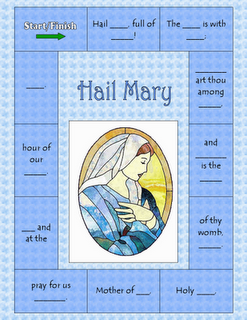 In each box there will be a rosary, and a piece of paper telling with a mystery of the rosary. At Mary’s birthday party, ask for volunteers to lead a decade of the rosary. At the beginning of each decade, the leader can come forward, take a rosary from the box, read the slip of paper with the mystery for that rosary, and lead the decade. Any cake would be a great cake for Mary’s birthday! I would suggest icing your cake in white (to symbolize purity) and blue (Mary’s color). If you’re getting together with friends for a Marian celebration, consider making a cupcake rosary! You can have 3 families sign up to bring about 20 cupcakes each, iced white, and one family to bring the “Our Father” cupcakes iced in blue. You can use a real crucifix for the bottom, or assemble with a cake, cupcakes, or chocolate. If you’re only one family and 50-something cupcakes is WAY too many for you, you could make a “one decade” cupcake rosary, or assemble rosaries out of something smaller such as marshmallows and candy. 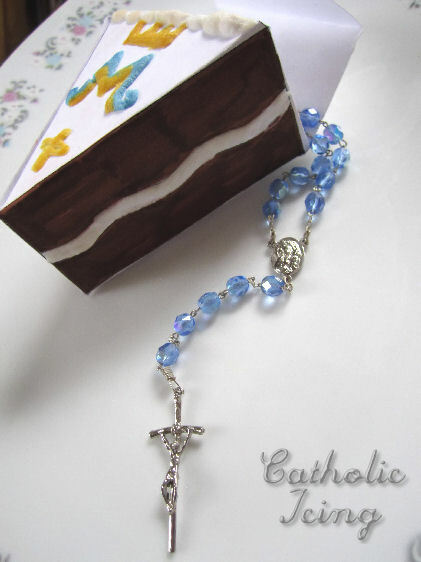 Find some pictures and ideas for making edible rosaries here. Put 10 candles on the cake. Pray one decade of the rosary, lighting one candle for each Hail Mary. When you’re finished, sing “Happy Birthday” to Mary, and blow out the candles! I love singing Mary songs! You can find lyrics and guitar chords for Haily Holy Queen here. I really need to find the time to post some more lyrics and guitar chords for Marian songs! Some other songs you could sing are the Hail Mary, Immaculate Mary, or Ave Maria. Thanks always for your wonderful ideas!